Alexis has always been Nicole’s mimic. When Nicole announced she didn’t like pants with buttons, Alexis went through a phase of insisting “no buttons!” while getting dressed, even though none of her clothes have buttons in the first place. So it was no surprise she showed an interest in using the potty after watching big sister Nicole do it. Shortly before turning two she would announce “Potty!” while running to the bathroom whenever she had to go. Alexis would then sit down on the little kids potty and use her diaper. We were sure potty training in earnest wasn’t far away. Before she ever gave us enough advance warning to remove her diaper in time, however, she lost interest. Domingo and I like to use mini rewards to encourage emerging behaviors like peeing in the potty. Nicole’s always liked the fruity, gummy candies best so she got gummy bears. 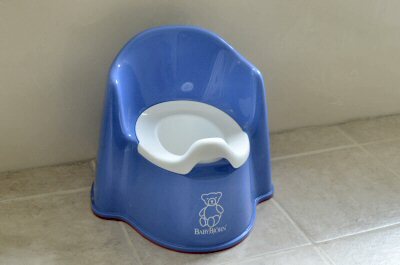 For our little chocolate lover, we decided to offer M&Ms when her interest in the potty returned. At first Nicole was a bit miffed to learn Alexis would be rewarded for using the potty. Four year old logic is all about equality, not equity. She had forgotten all about the days of gummy bears, and wanted the same reward for the same deed. While I could understand where she was coming from, it seemed rather indulgent to give Nicole, whose been a potty pro for over 18 months, a reward for continued potty use. Our compromise was to give both girls the same reward when Alexis successfully peed in the potty. Rather than risk a jealous divide, we thought we’d try to unite them onto the same team. The result was a big sister cheer leader who was the first one to tell Alexis she could do it, and sing her praises when the deed was done. We needed to make sure Mom and Dad were aware and could dole out the rewards, after all!